Fabulous Frogger: My Giveaway Update - New item added! 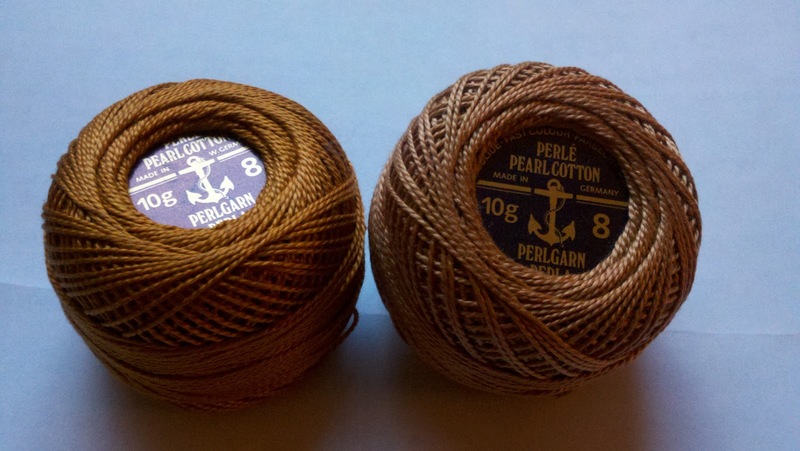 Since I've had 16 new followers since my contest started, I'm adding some Anchor #8 Perle Cotton floss in Nutmeg and Spice colors. Here's a close up...the x's are so teeny tiny on 22 count! So on a side note - I started a new diet today! Yes, I know....just before the holidays!! :) I'm determined to see it through. Hubby and I are on a 90 day challenge to lose the flab. I should get much more stitching done during this time....my hands will be less busy stuffing my face! Anyhoooo....... Thanks again to those of you that take a moment to read my posts and comment. I love all the virtual friendships I'm developing!! Have a great stitching week!! Good start. That's a few stitches less to do :) Looking forward to more. Congrats on your new start. I have a super hard project that I want to start soon and I am also going to trying the grid for the 1st time. I hope hope hope it will be a big help. I have never done a big project before. I can't wait to see more of your haed. Lesli, I love the nutmeg and spice colours - gorgeous. Also, your works in progress are looking great so far. I must admit that I haven't bothered gridding my fabric for my HAED but I have noticed that lots of other stitchers have. Do you think it is helpful? How do you do it so accurately? P.S. Good luck with the diet. I am completely in love with the gridlines! I found this site a while back, and I basically follow their directions on stitching the lines, I just use my own thread instead of theirs. I know some stitchers also draw their lines on, using washable pens/pencils with stitching rulers that mark every 10th "hole" for 14 ct - 22 ct fabrics. 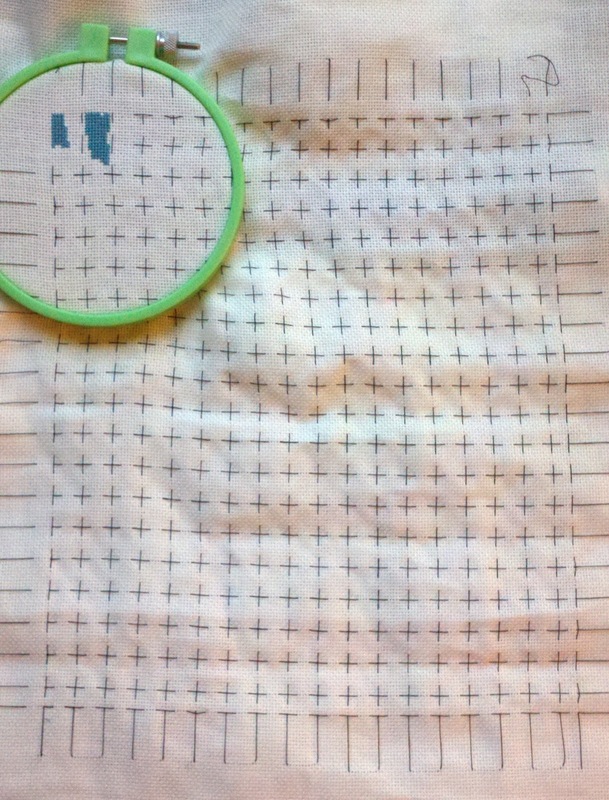 I just worried about the lines not washing all of the way, so I chose the thread route. 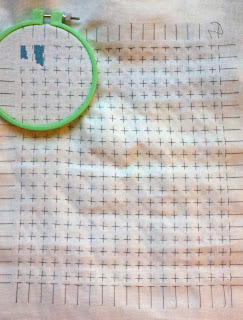 I love how much easier it is to find the right spot to start a new color floss...I just find the same grid spot from my chart on my fabric and stitch away! I blame my absentmindedness on my lack of calories! Ooh, that Perle cotton is perfect for the festive season. Whoever wins is going to be very lucky indeed. I don't think I could cope with a HAED so I'm very much looking forward to seeing this one grow. Good luck on the new diet! Hi Lesli, I also plan to start my very first HAED on January 1st. 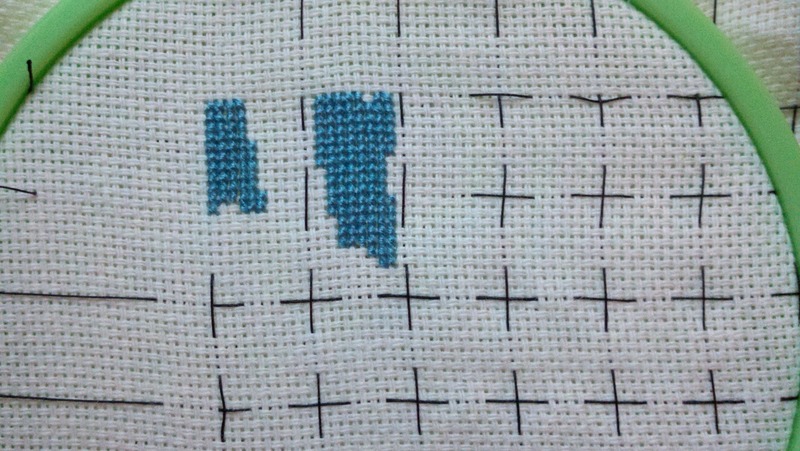 I see lots of stitchers using grid lines. Yours look so nice! Thank you for the link to the directions on how to grid. I will get my fabric ready before January. I have 25 and 22 ct, but haven't decided which to use yet. 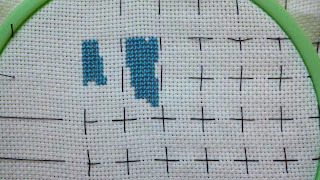 I also haven't decided if I will stitch tent stitches or full crosses.